Kozhukhar, Volodymyr [Кожухар, Володимир; Kožuxar], b 16 March 1941 in Vinnytsia. Conductor and educator. Upon graduating from the Kyiv Conservatory in 1963, he was appointed conductor of the Symphony Orchestra of the Ukrainian SSR (later Symphony Orchestra of Ukraine), and in 1973 conductor of the Kyiv Theater of Opera and Ballet as well. Since 1977 he has served as chief conductor of the Moscow Music Theater. His repertoire includes F. Haydn, W.A. Mozart, L. Beethoven, C. Debussy, G. Gershwin, Peter Tchaikovsky, Sergei Prokofiev, and Dmitri Shostakovich. He has recorded systematically the works of such Ukrainian composers as Lev Revutsky, Borys Liatoshynsky, Heorhii Maiboroda, Andrii Shtoharenko, Lev Kolodub, Vitalii Hubarenko, and Myroslav Skoryk. He taught opera and orchestra conducting at the Kyiv Conservatory (1965–77) and then held the chair of orchestra conducting at the Gnesin Music and Pedagogy Institute in Moscow. Since 1993 he has worked as professor at Kyiv Conservatory. 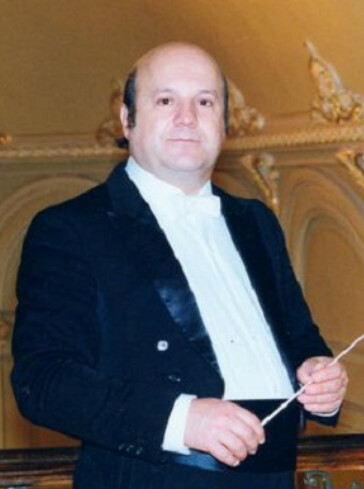 Between 1989 and 2011 Kozhukhar was the head conductor of the National Opera of Ukraine.